Hardbound. 280 pages. 14 photographs.7 maps. Notes. "Tip of the Spear" is Greg J. Michaels’ experience as a Marine Non Commissioned Officer` in a Light Armored Vehicle (LAV) company in the 1991 Gulf war. Not the fiction of a technology thriller, it is the first book written on present day US wheeled armored vehicles in combat, and the men who fought in them. It looks at the mission of the LAV units, the needed training that is difficult in peace and the capable leadership of a unit’s Non Commissioned Officers and Officers required to be cohesive and functional. These real experiences include the effort to operate effectively in a desert environment devoid of recognizable terrain features that are basics of map reading and land navigation. Early Global Positioning Satellite receivers (GPS) helped but there were not enough units and experienced users to make a difference. Communications, even with the frequency hopping SINCGARS radios could and did not always work. Contact with aircraft providing ground support was only possible with the command vehicles and there were several occasions of mistaken identity by friendly aircraft that led to Marine casualties. An Identification Friend or Foe (IFF) device could have also helped in preventing these accidents. Greg Michaels looks at his experience in Desert Storm as the manifestation of Honor, Courage and Commitment. Michaels understood that this was their purpose in Desert Storm; to free Kuwait. The book serves as an insight into the organization of the Light Armored Infantry Battalions (LAI) s where the LAV-25 and its variants serve. The vehicle’s combat experience will influence the future utilization of the US military’s largest number of wheeled armored vehicles. The Marines have used the LAV flexibly in its role of reconnaissance, mechanized infantry, or infantry support. The new versions of the LAV are a TOW combination on a 25mm turret and the 4.2-inch breech loaded mortar turret, fire support version. The readers can relate to Michaels’ examples of good leaders in an organization and their dedication to the men and the unit. It reminded me of the concern of a Philippine Marine officer who had the same drive for his unit. The Philippine Marine Commandant raised a toast to him as one of the "most professional" officers in the Marines and the AFP. He added his regret of losing this good officer who had requested to retire after his completing his tour as the Commanding Officer of the 6th Philippine Marine Battalion. This book will be of interest to the Philippine Marines who use the other contender of the United States Tank-automotive and Armaments Command (TACOM)LAV trials, the V-300 manufactured by Textron (Cadillac Gage). The V-300 was provided to the Philippines as part of the last Military Aid package for the former US bases at Clark and Subic. The APC variant has a manually traversed turret similar to that on the AAV-7. It is armed with a .50 cal M2HB machine gun and a 7.62mm machinegun (M60) in place of the 40mmAutomatic Grenade Launcher (AGL) of the AAV-7. The Philippine Marines also have the 90mm gun turret of the V-300 as a fire support vehicle. The US Naval Institute publishes books that are in the interest of the sea service and the Marines. These may not always be a commercial success, but are deemed important by the editorial board that they are put into print by the Institute to disseminate ideas that affect the Navy and the Nation. The Institute has again accomplished this goal with the release of "Tip of the Spear,". 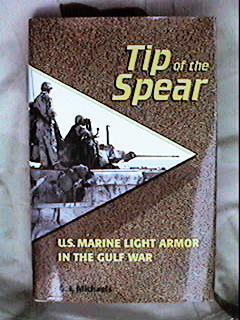 "Tip of the Spear, US Marine Light Armor in the Gulf War"
Copies of "Tip of the Spear" are available directly from the US Naval Institute bookstore, Beach Hall, USNA, 291 Wood Road, Annapolis, MD, 21402, USA.